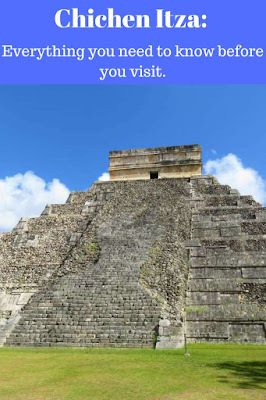 The Travelling Lindfields: Chichen Itza: Everything you need to know before you visit. Have you ever read a travel story in a newspaper or magazine (these days it is more likely to be a blog) and thought to yourself 'that is a place I just have to go'. Chichen Itza was like that for me. Way back in the early 2000s, I opened the Sunday paper to a story on a group of ancient Mayan temples I had never heard of. It was Chichen Itza. One glance at the photo of El Castillo, the massive step pyramid at the centre of the complex, and I was hooked. For once David took very little convincing, Mexico was already on his bucket list, but as it turned out it would take us ten years to get there. When we finally did, Chichen Itza was every bit as breathtaking as I imagined. One of the 'New Seven Wonders of the World'. Chichen Itza was inhabited by the Mayan people of Mexico's Yucatan Peninsula from around AD 750 to AD 1200. 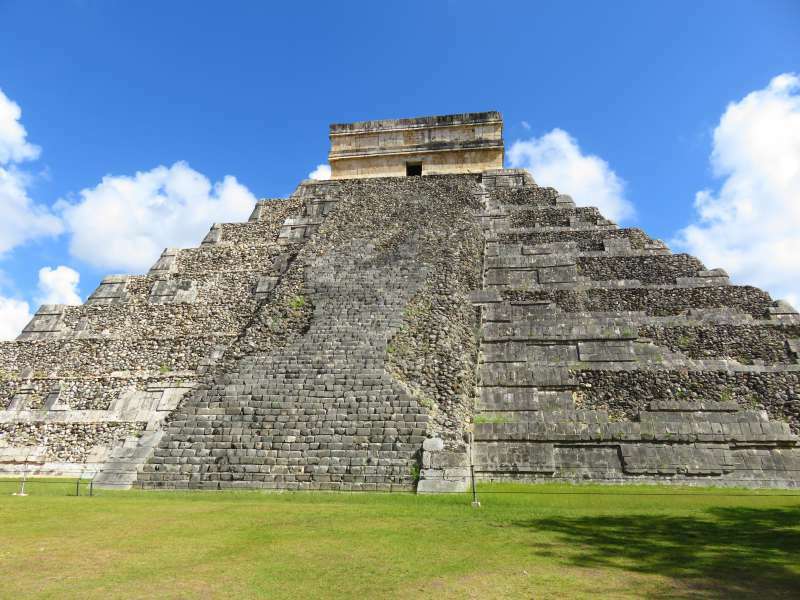 Although its most recognisable feature is 'El Castillo' or the 'Pyramid of Kukulcan', Chichen Itza was an entire city and today is an archaeological complex which includes temples, a ball court, platforms, columns, an observatory and cenotes. There are three major influences at Chichen Itza, - Maya, Toltec and Itza - but the precise chronology and influences of each group is unknown. The name Chichen Itza means 'Mouth of the Well of the Itza'. The only disappointing thing at Chichen Itza is how little is known about its inhabitants. Touring the site and being awed by the architecture I was struck by how few of the explanatory signs had information on how the Mayans lived. There is a great deal of detail about the complex's architectural details and almost nothing about its people. Rising like an ancient Egyptian monument in the centre of the complex you can't miss the stepped pyramid El Castillo. At 30 metres high (100 feet) it was not as big as I expected, but no less awe inspiring. 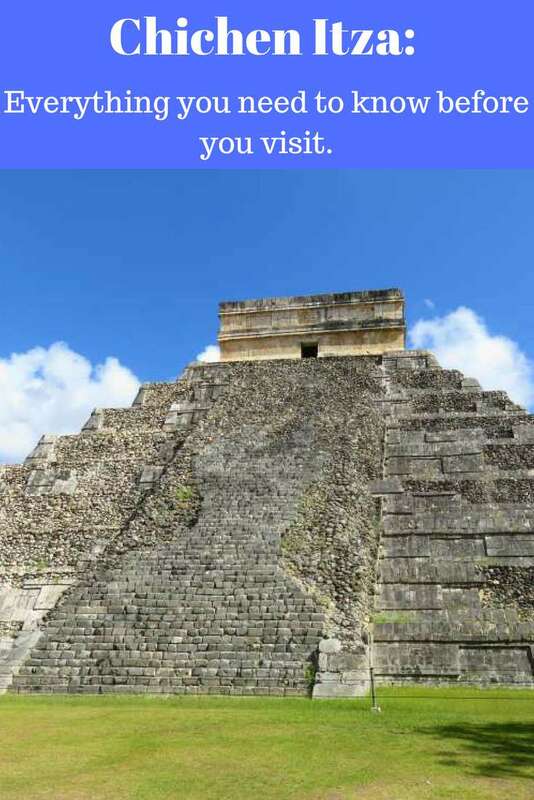 Built as a temple to the 'feathered serpent' God Kukulcan, El Castillo has 9 levels representing the 9 levels of the afterlife and 365 steps, one for each day of the year - 91 on each side and one to enter the temple at the top. The stairs climb at perfect 45 degree angles. 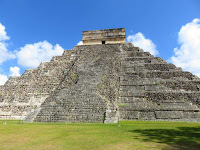 On March 21 and September 22, the spring and autumn equinoxes, the sun creates a zig-zag shadow on the steps and lights up stone serpent heads at their base giving the illusion of serpents slithering down the sides of the pyramid. It is probably best not to visit then unless you enjoy crowds. El Castillo was built in 800 A.D., over an existing pyramid which may have been built as many as a thousand years before. A Chacmool, sacrificial altar, is inside the upper temple and another can be found inside the older inner pyramid. Neither are accessible to the general public. Although visitors could once climb El Castillo they are no longer permitted to do so. 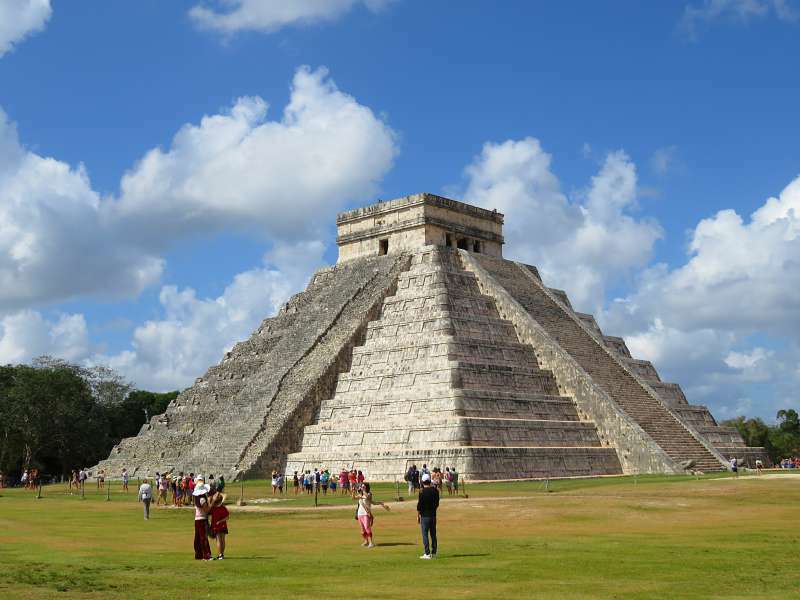 El Castillo is the main drawcard for tourists at Chichen Itza. The gates open at 8 a.m. If you arrive in the morning go there first for a crowd free experience. We didn't arrive until about 10 a.m (its a long story) and for the first half hour or so we pretty much had the place to ourselves. By about 11 a.m tour buses begin arriving with hundreds of visitors from the beach resorts on the east coast. Don't miss the Great Ball Court. Next to El Castillo it is one of the largest and most impressive structures. At 135 metres (443 feet) by 65 metres (213 feet) the playing field is larger than an American football field. The game was played by two teams whose aim was to hit a ball through a ring using only their elbows, wrists and hips. The rings, set into two parallel 8 metre (26 feet) high walls on each side of the field, look impossibly high. At the end of the game the Captain, or perhaps the whole team, of one side was sacrificed to the Gods. There is some disagreement over which side was sacrificed - the winners or the losers. David standing near one end of the Great Ball Court. Can you see the rings? One of the rings on the Great Ball Court. 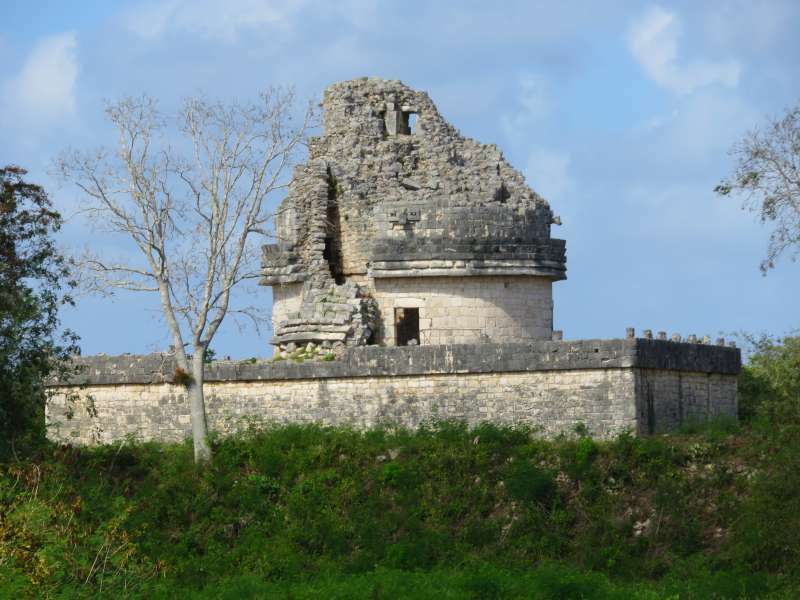 The Snail Shell in English, El Caracol was an ancient observatory used to study celestial events. From the balcony of our room at Hotel Mayaland we had a great view of El Caracol. The view of El Caracol taken from our hotel room balcony. 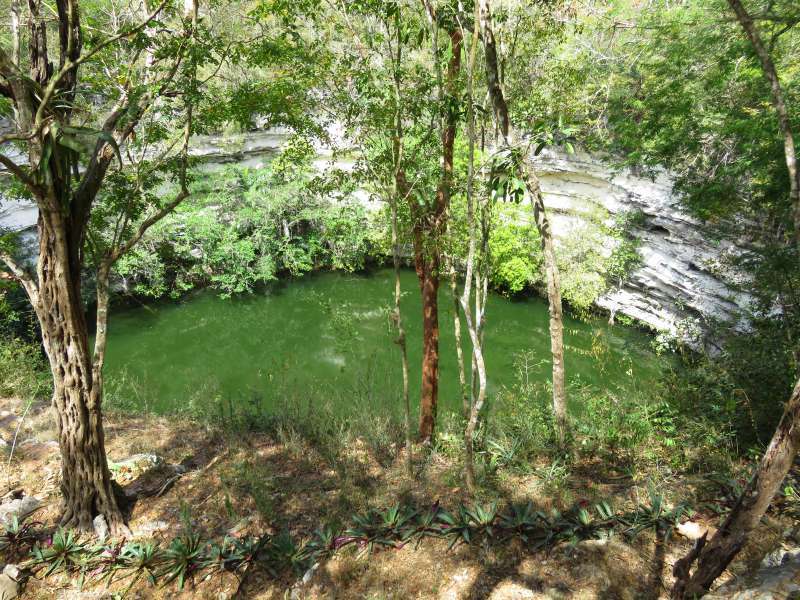 300 metres (984 feet) north of the main structures of Chichen Itza, the Sacred Cenote is worth the walk if only for its morbid fascination. This was a place of human sacrifice. The remains of scores of victims, mostly children and young adults, have been recovered from its depths. The name of the Temple of Warriors comes from images of warriors carved on the rectangular columns in front of the temple. Some appear to be prisoners with their hands tied behind their backs. 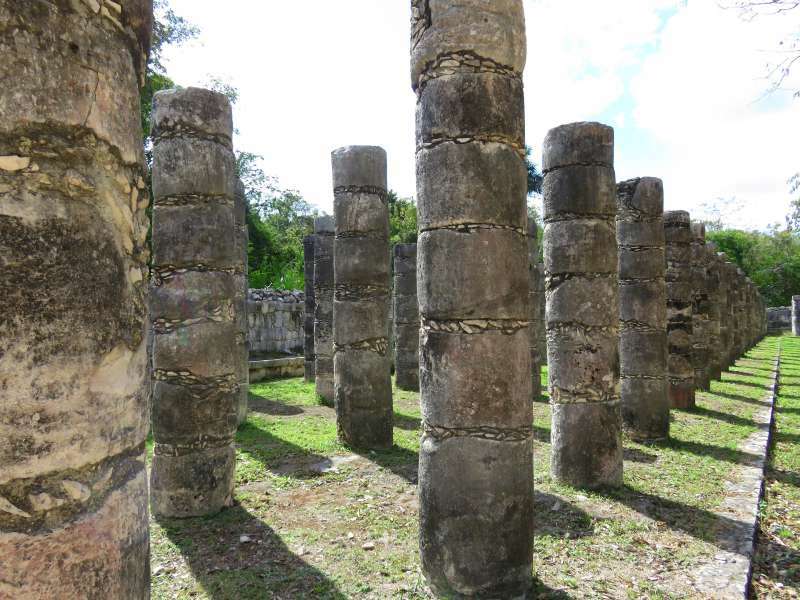 Next to the temple are row upon row of circular columns which may once have supported a roof. Are there a thousand of them? Who knows - I didn't count them. If you visit Chichen Itza and count the columns come back here and leave me a comment on whether the full thousand are there. The Wall of Skulls is creepy, but strangely compelling nevertheless. 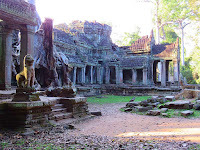 Not far from the Temple of Warriors there is a low T-shaped platform with row upon row of carvings of skulls. Look closely and you will also see warriors holding decapitated human heads as well as snakes intertwined with skeletons and eagles devouring human hearts. Some of the skulls may well have been modelled on the sacrificed losers (or winners) from the Great Ball Court. Their heads, along with those of other sacrificial victims, were displayed on the platform. Chichen Itza is open between 8 a.m and 4.30 or 5.00 p.m. Try to arrive before 10 a.m and you will beat the tour bus groups flooding in from the east coast beach resorts. The cost of admission is 242 pesos. Bring some ID and cash. Apparently the credit card machine is often out of order. There is a cash machine but who knows whether that will work when you need it. Don't be surprised if you are asked to pay this in two separate amounts. There is a charge for the site itself and then another which goes to the State Government. Tickets for each are issued and collected separately by different officials at the same counter and gate. There is a separate fee for the Sound and Light Show each evening. I would like to tell you it is worth seeing but David and I were so tired and jet-lagged we didn't make it to the show. If you don't speak Spanish you might want to check whether there is an English translation available. I understand you can get a translation via your smartphone. Avoid visiting on Sundays when Mexicans get in for free. You don't need a guide. All the explanatory signs are in three languages, one of which is English. Make sure you pick up a map (we got ours at our hotel) because the site is quite large and some of the ruins are tucked away in the jungle where they are easy to miss. Chichen Itza is a two and a half hour drive from Cancun on the cuota (toll road). The road is in excellent condition until you get to Piste (2.5 kms from the complex) when it deteriorates into a village road. Try not to arrive after dark - we did and it was a mistake. Navigating our way to our hotel at night was neither fun nor easy. 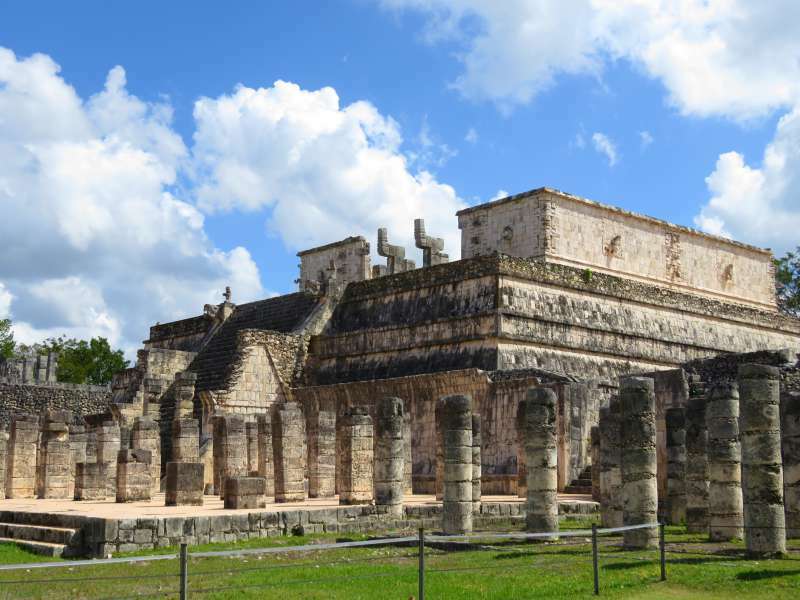 There is a time zone change of one hour between Cancun and Chichen Itza. Don't forget to take it into account when working out what time you will arrive. 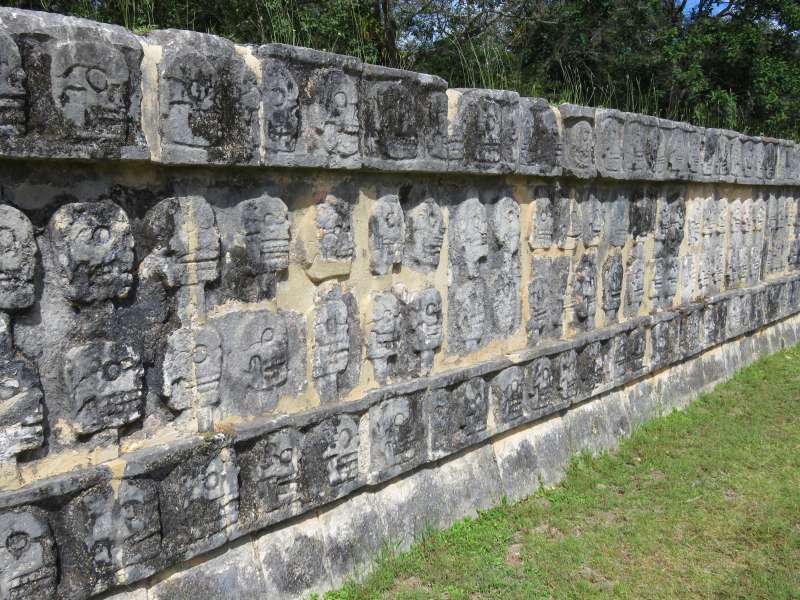 Chichen Itza is slightly closer to Merida, at one and a half hours, and only 45 minutes from Valladolid. Again the roads are excellent. It is worth having enough cash for the toll roads. We were warned not to pay with a credit card if we could avoid it. Apparently credit card skimming is a problem. We stayed at the Mayaland Hotel. Apart from being very difficult to find at night it was excellent. 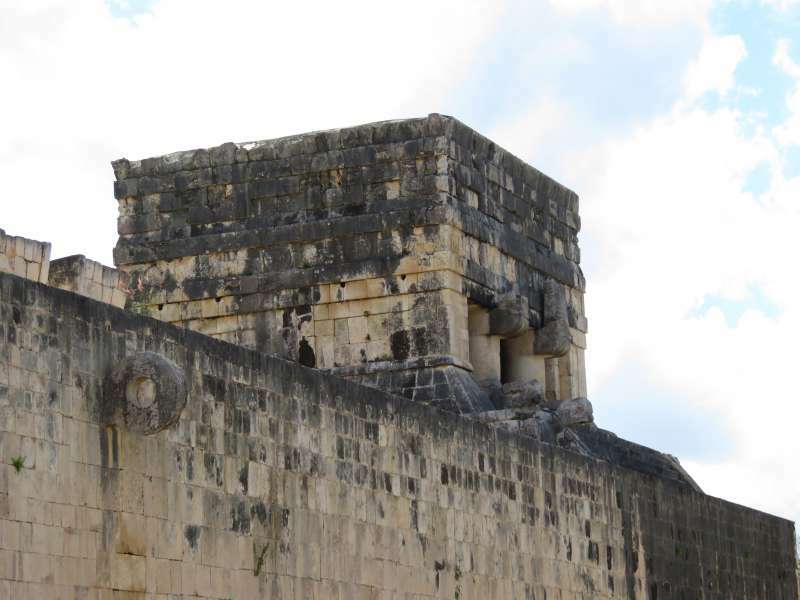 It is the closest hotel to Chichen Itza and there is a path leading directly from the hotel to the ruins. If you get a chance it is worth upgrading to a room with a view of the Observatory. The nearby town of Piste had lots of accommodation. Ladies, if you husband/partner is in a loving, caring, generous mood (because you have just been diagnosed with a serious heart condition) keep him away from the souvenir sellers because they will take advantage of him mercilessly. No matter what time of year you go it will be hot and humid. Take sunscreen, a hat and plenty of water. If you forget the water, there are places inside the complex where you can buy it. Yes, I am hooked - absolutely. I would love to go back. While it was crowded, because the site is outside and so large we didn't find the crowds a huge problem. I have a stack of clippings to work my way through...a good reminder to work my way through them, instead of having them gather dust on my desk! Great story! I am a bit lost here on what your comment means. Are they clippings of Chichen Itza? I've been to the ruins at Tulum, which I found fascinating, but not to Chichen Itza. El Castillo is certainly impressive and I can't imagine how impressive it is in person. Adding it to the list! We also went to Tulum. Tulum is stunning because of its site right on the coast but for me Chichen Itza had a lot more WOW factor. That game they used to to play in the Great Ball Court sounds terribly difficult, using on hips, wrists and elbows! I can't even imagine the strange bodily movements they had to do to accomplish that game! Thanks for sharing on #TheWeeklyPostcard! I have a guide book with an artist's impression of a ball court player and you are right - it looks weird. Apparently they wore a lot of padding which might have helped. Chichen Itza is an amazing place and a testament to the Mayan culture. I would not want to be a player on the Great Ball Court but I guess the incentive was enough to keep the players going for the win. Not if the winners were the ones sacrificed. Although it seem unlikely to us that it might be the winners, there is dispute about which team got the 'honour' of being sacrificial victims. Chichen-Itza holds a very special place in my heart. It was the last place I visited with my husband when he was still my fiancé (we were married in Cancun the next day.). Reading through your post brought back a lot of memories. If found the entire site utterly fascinating. Great tips and advice. I am so glad my post brought back special memories for you. David and I have a few places like that around the world - not necessarily the big drawcard sites but places we remember with fondness. I visited Chichen Itza in the late 80s. We climbed El Castillo, which was allowed at the time. There was a downpour while we were at the top so we hid from the rain in the Upper Temple (also open then). When it was time to go down, the stairs were slick and slippery. We had to hold on to a rusty chain to make it down without falling. There were only 4 or 5 other people there the entire time we visited, and I don't remember a fee to get in. Incredible place! Yes, it is an incredible place. I climbed one or two of the other Mayan pyramids while we were in Mexico and I have to say it isn't really necessary. Except for the fact that you can't get into the temple I don't think you lose much by not being able to climb it. It sounds like you found Chichen Itza before the rest of the world did. Having said that, the site is so big the crowds didn't really bother me. This comes in very handy. We have scheduled a two-week stay in Cancun next year! Will definitely be able to visit Chichen Itza finally! You could also visit Coba and Tulum. Coba was my favourite pyramid. I will blog about it soon. It is much more hidden away in the jungle than the other pyramids in the Yucatan Peninsula. Chichen Itza really looks remarkably unchanged from the last time I visited - around 10 years ago. It's great to hear how well-preserved it is. The cenote looks as still-wild as ever. And you're right - it's incredibly hot and humid. Astonishingly so! Chichen Itza has been reconstructed. I found a few old photographs on the internet and it was once much more of a ruin. Your post brought back memories for me re. 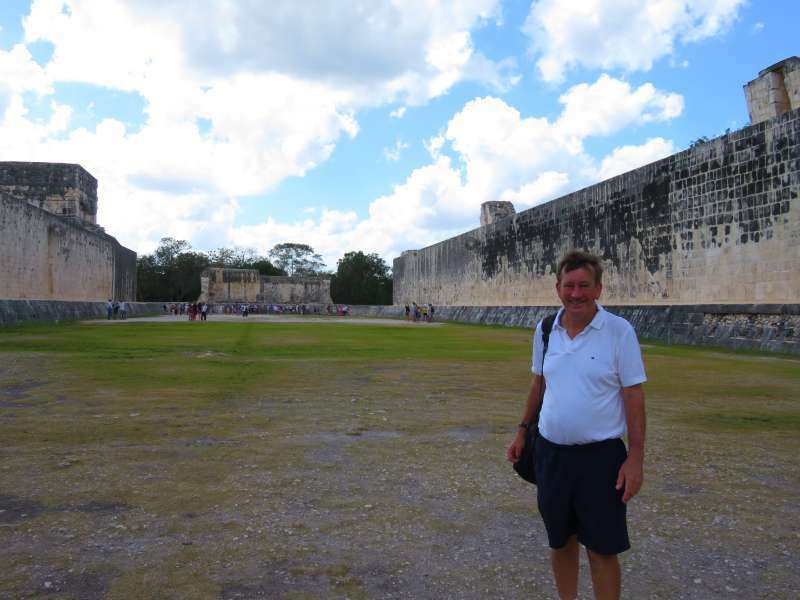 my own visit to Chichen Itza. It is certainly an impressive site. That is a great tip about avoiding Sundays because Mexicans get in free. I'll bet it is a zoo then. That sounds like a great policy and I'd like to see it adopted in my own home town. Allowing locals in for free or at discounted rates to see their own heritage sites is something I wholeheartedly support. I seem to remember Egypt does a similar thing with the pyramids. It was stunning. I loved every minute of it. Really useful tips. I think we stayed at the same hotel, and we were thrilled to get in early and spend the day. Pinned! I don't normally mention hotels but I thought this one was exceptional, mainly because of its location right next to Chichen Itza.